Beatrix Potter is one of the names that quickly comes to many people’s minds when they think of the Lake District. However, unlike William and Dorothy Wordsworth, she was not native Cumbrian. She was a London-born lady who fell in love with the Lake District early in life during holidays there with her family in the 1870s and 80s. 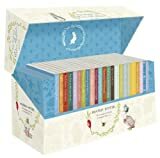 She created the much-loved characters of Peter Rabbit, Jemima Puddle-Duck, Mrs. Tiggy-Winkle and many more, and from the first publication of The Tale of Peter Rabbit in 1901 wrote a steady stream of beautifully illustrated children’s books, combining her skills of painting and writing in a way that attracted rapid fame and fortune. Beatrix fell in love also with her publisher, but her well-to-do family considered him to be rather below her station in life and were opposed to the relationship. His early death, during the period of their secret engagement, left Beatrix Potter devastated. Shortly before his death in 1905 she had invested a legacy and money from her royalties on purchasing Hill Top Farm at Sawrey in that part of Lakeland which then was the northern tip of Lancashire (now, since the 1974 county boundary changes, incorporated into the new county of Cumbria). She spent as much time there as she could, but frequently the demands of her family led her to spend extensive periods in London. Hill Top eventually became Beatrix Potter’s home. Over the years she acquired considerable areas of land and was an enthusiast for the Lakeland sheep breed, the Herdwick. She married a local lawyer (once again considered by her family to be beneath her), becoming Mrs. Heelis and living in the Lake District until her death at the age of seventy-seven in 1943. Beatrix Potter’s long relationship with the Lake District is well illustrated in this book. Click on the graphic for details. From her base at Sawrey Beatrix Potter she explored great areas of the countryside around and became an active preserver of Lake District landscape, buying extensive tracts of farmland to protect it from what she considered to be inappropriate development; this is now in the capable hands of the National Trust. Her home, Hill Top, Sawrey, is open to the public. (Note: Hill Top is a small property so a queuing system is in operation at peak times; it also closes for one day each week). In Hawkshead the former law offices of her husband, William Heelis, are now the site of the Beatrix Potter Gallery, run by the National Trust. Next post: Lake District Accidents – and Reactions!